Washington, DC - Today the Iranian American Political Action Committee (IAPAC), the connected PAC of PAAIA, proudly announced its endorsement of Democratic nominee Shireen Ghorbani for Utah's 2nd Congressional District Race. If elected, Shireen would be the first American of Iranian descent to hold a position as a member of Congress. Shireen grew up in North Dakota as the daughter of an Iranian father and American mother. She has served in the Peace Corps, obtained two master's degrees, and is currently employed at the University of Utah in communications and organizational development. Shireen also has over 20 years of advocacy experience working with and supporting victims of sexual violence, and she currently serves as the Board Chair for a local non-profit that works with victims of sexual violence. 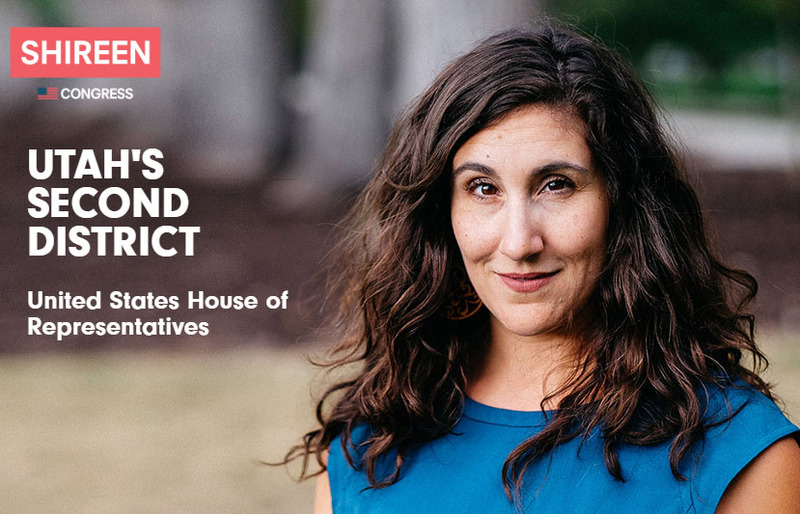 Shireen's campaign has been endorsed by numerous state and local public officials and organizations, and a recent poll shows that Shireen is gaining on her opponent, Congressman Chris Stewart. Her campaign has achieved an incredible jump in name recognition and voter enthusiasm through an entirely grassroots effort. Recently, PAAIA had the opportunity to interview Shireen about her campaign. PAAIA: What motivated you to run for public office? Shireen: In 2016, I lost my mom to pancreatic cancer. She was an educator her whole life and largely raised me by herself. When she got the diagnosis, we sat around our kitchen table and talked about what we would have to do to get her the kind of care she needed. Would we have to deplete every dollar she ever saved? Would we need to sell her house? We didn't have to make any of those decisions because she had enrolled in Medicare and it was there for us when we needed it. I could no longer watch my representative vote to gut healthcare without solutions for Americans seeking access to affordable care. I am also the daughter of an immigrant. My father was born and raised in Iran. I'm deeply troubled by the President's actions and words that harm immigrants, specifically people of color, in this country. PAAIA: What are some of the challenges you believe your campaign committee must overcome and how will you communicate your ideas to the public? Shireen: This district is currently held by a Republican incumbent, but as recently as 2012 many parts of the district were held by Democrats. The votes are here, and our most important goal is turning out the vote and encouraging people to get involved. The primary focus of our outreach is door knocking. My team and our volunteers have contacted over 30,000 voters so far and have a plan to reach thousands more before the election. I have also published several op-eds in local papers. I am actively engaged on social media and my online presence is growing by the day. PAAIA: What differentiates you from your opponent? Shireen: My opponent is out of touch with the realities facing Utah families today. The bills he has sponsored and cosponsored, and the votes he is taking, do not reflect what I am hearing from constituents are the most important issues to them. What I am absolutely certain of is that many people feel unrepresented and left out, and that's Republicans, independents, and Democrats. PAAIA: What are the most critical issues facing your district today? Shireen: Healthcare, education, affordable housing, and clean air are the most critical issues facing this district. I knock on doors and speak with voters whose lives have been devastated by our lack of affordable healthcare in this country. Utah families in the Salt Lake Valley are ready for a new voice, someone who will stand on the side of everyday Utahans. Utah's 2nd District is also an important race for the future of our National Monuments. The President's recent actions to reduce the size of two National Monuments in Utah, Bears Ears and Grand Staircase Escalante National Monument, are the wrong decisions for this country and for the rural communities in my district that have seen sustainable economic growth as a result of visitors traveling to our public lands. PAAIA: Tell us your views on immigration and how you will balance it with national security concerns? Shireen: We are a nation of immigrants. Immigration is a powerful part of Utah's history and vital for the United States' continued economic and cultural success. Our immigration system needs repair. We can and must reinforce our national security in a way that also defends each and every person's dignity. Instead of pushing ideas that will cost enormous amounts of money and do very little to further either of these goals, I am in favor of smart spending on national and border security. Shireen: I would welcome supporters who identify with me, my campaign, and my vision of this country. I hope that the Iranian American community could be some of those supporters. I would be proud to represent this community at the federal level - by being what I believe would be the first Iranian American elected at the federal level.